---Of being sad in their fantastic trim. ---The fountains tall to sob with ecstasy. About the room where perfumes Her stray. To that dim ditty's dreamy rise and fall? What do you want with me, pale melody? A little open on the garden small? The second poem is untitled, its epigraph roughly translating as "Joyful, troubling sound of a resonant keyboard." 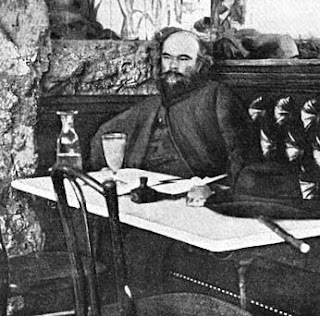 We've all experienced the feeling Verlaine characterizes here, a certain undefinable haunting by a melody or piece of music. The feel he evokes is for me reminiscent of Proust's sensitivity to music and it appropriately ends with a question. The poems are translated in an early English edition of Verlaine by Gertrude Hall and, though they do suffer the occasional strain of inverted syntax for the sake of rhyme, seem to carry the most sense for me of editions I've seen. I must hasten to add that I haven't seen many editions and so would welcome any suggestions in this area. Here's the opening ten minutes of the movie Total Eclipse (and if it works like it did on my computer, the whole movie will play in sequential parts), about the relationship between Paul Verlaine and Arthur Rimbaud. Today is also the birthday of the original Sonny Boy Williamson, John Lee "Sonny Boy" Williamson (as opposed to the better known Rice Miller "Sonny Boy Williamson," who co-opted the name). Here's the first part of a short biographical tribute (13 minutes total, in 2 parts). I just received notification that coming this May, Bloodaxe Books will be hosting a tribute for one of our best living poets, Jack Gilbert. Here's the notice via poets.org and via Facebook, which is how I received it. The publication in recent years of the retrospective Great Fires and the excellent Refusing Heaven collection has brought Jack some long deserved recognition. 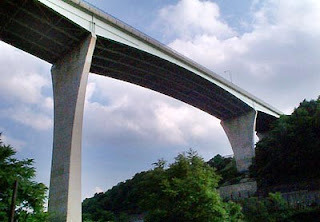 Here in Pittsburgh we cherish a more modest selection of work, published by the small press publisher Pond Road Press, entitled Tough Heaven: Poems of Pittsburgh. Pittsburgh has always been a backdrop for the work of Jack Gilbert, a symbol of youth and the not-so-nostalgic past. The Pittsburgh he remembers, like his fellow compatriot and good friend Gerald Stern, is a Pittsburgh long gone, a Pittsburgh forward looking politicians and the nouveau rich, whose hands are today mired in a different kind of grime, would sooner forget. But the ghosts are here, they are everywhere; just as those of us who walk these streets and struggle for a livelihood see them in the corner of our eyes, fleeting and gone in the early morning fog, they followed Gilbert everywhere he went, woven through his work as a thick tangle of twigs in a long abandoned nest. And that work is at once beautiful, sad, and immensely moving. Here's a taste of that Pittsburgh long gone, the ghost of yesteryear and, yet, somehow the true hope of tomorrow, a hope without which no desperate economic Renaissance pogrom can ever dream of succeeding. We've lived through a few of those here and still we persist, because or despite of any measured, concerted efforts, because, in truth, on the best of days, we stand hand-in-hand with the very ghosts Jack Gilbert evokes. along the three rivers. The authority of them. Courtesy of the always excellent poetry blog Five Branch Tree, here is Charles Olson reading the poem he described as his best, "The Librarian," in an animated fashion, replete with Zero Mostel eyebrow articulation. 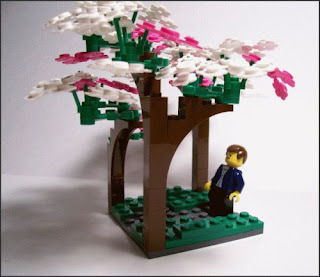 Since, of course, it is the season of the cherry tree, perhaps the poem "The Loveliest of Seasons," pictured above, would be more appropriate. Give it a try. I'll be raising that pint. By the physicians of Memphis? Snug on the back of the crocodile? As I stood fuming by the Nile? O life abandoned! half-embalmed, I beat the soil! Still-omen of the dribbling Scarab! Fate that leads me into the chamber of blue perfumes! Than that Decker who decks my spinewith ostrick plumes? Fall unto the Jackal's plate. This is a powerful poem that bears up with many repeated readings. One of the first things that occurred to me was, damn, sounds like Baudelaire. In a good way. The combination of "dropped my eyes unwilling to explain" and "the time was neither wrong nor rights" goes right to the core of things. Sort of like what might have happened after you chose one of those two roads. Today is the 90th birthday of Lawrence Ferlinghetti. He has been the touchstone of generations of poetry readers; if you had never read poetry, somehow, somewhere, if you had the inclination to, you'd run into the work of Lawrence Ferlinghetti. It seems as though serendipity and that is his magic. amid new spring trilliums, wild cherry petals. Enjoy it all - as long as autumn seems to linger, spring flies by. The sixth anniversary of the beginning of the war with Iraq has passed relatively quietly. It's ho-hum in the States, where the absence of a military draft assures a lack of significant engagement by the general populace (read: us) because we are collectively too busy trying to insert our heads still further up our asses (read: Facebook, Twitter, blogs). It's funny when you walk past something everyday and you read it and you think about it and it begins to sink in and it plants a tiny seed that just needs a little water and a little light. This little seed has gotten plenty of light and water over the years and I think I've begun to see its very far ranging implications. Race is something that has spent a lot of time in the foremost part of many peoples minds over the years here in America. It's about time class was next. Which is all the long way round to revisiting the collection I Hear My Gate Slam: Chinese Poets Meeting and Parting, selected and translated by Taylor Stoehr. Why would I ever be thinking about class and war and class war and America on this 6th anniversary of the Iraq conflict while reading a collection of classical Chinese poetry? ----------and marched off to death. this year it was Onion River Road. grazed our horses on T'ien Shan's snowy side. our armies grow old in their armor. have sown the yellow desert with our bones. now it's the Han that light the signal beacon. year in year out, the war goes on. riderless horses whinny at the sky. hand them high on the withered trees. while generals map the next campaign. is no better than losing one. His water buffalo bellows a complaint. the clods explode under its hooves. to feed the soldiers God knows where! to slaughter the buffalo and take away his cart. They leave him two buffalo horns. for without grain for taxes he must sell the house. he has an heir, and the buffalo a calf. Supplies for the army must never run short! There are many, many more fine poems in this collection, some on war, most on friendship, loss, and love. I've returned the library copy and purchased my own. Having read it twice through and dipped in many more times, I know I will be returning to it again and again. I can only hope that, over the years, it will sink in as well as the lesson gleaned going back and forth to work. Right now, I'm very, very slowly reading The Shadow of Sirius by W. S. Merwin. Though the poems are short and can be read through quickly, a glacial pace is recommended. At least, that's what seems to be working for me. I just keep mulling this poem over and over in my mind, a grit of sand and a pearl all at once. I will no doubt be reporting back at other things found in this collection. The next poem in the collection I Hear My Gate Slam, that I talked about previously, has a sort of lyrical segue with the Merwin poem, so I'll just end with that one rather than the handful more I had intended to finish with. River rising, cold and deep. Autumn rain darkens the heavens. look in your heart behind the billowing clouds! Well, I had a W. S. Merwin poem all ready to go this morning, but there is a typo and I don't have the book at hand, so I'll have to check it out when the book is in hand. So, it's time to punt. mold. The field has curves but it is one field. All things are different forms of the same thing. of sin, are alike just so many words. All three poems on two facing pages of the book opened at random: that's poetry, friends. 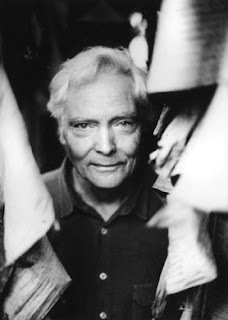 Perhaps I should misplace Merwin (and Jack, come to think of it) a little more often. I had the calendar marked for the 19th as the birthday of jazz master Ornette Coleman. In double checking before posting, I see his birthday was actually March 9th, not the 19th, so it seems the serendipitous mistake is the theme of the day. As a college professor of mine used to say (I believe he said it at least three times): once for the intelligent and aware, twice for the intelligent and unaware, and three times for the unintelligent and unaware. Well, I don't have to be hit over the head more than three times to go with the flow - today the mistake is the truth, so let's celebrate Coleman's birthday today. Enjoy. PS Ruminated and typed to the delicate, forthright word-picking of Jolie Holland. Ain't it all beautiful, eh, Ed? 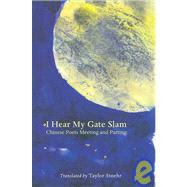 I ran across a book in the library last week from Pressed Wafer entitled I Hear My Gate Slam: Chinese Poets Meeting and Parting. 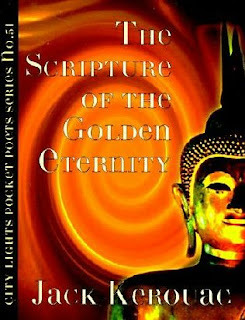 Though the title is not all that accurate a representation of the content and a tad unwieldy to boot, this is an excellent collection of work, translated by Taylor Stoehr, which I'd highly recommend to any reader with a predilection for Eastern verse. Though there are, indeed, quite a few poems on meeting and parting, as the subtitle suggests, there are also others with more general themes. The poets represented here are ones you would expect: Wang Wei, Tu Fu, Li Po. Happily, too, we find Han Shan and Po Chü-I, among others. Taylor Stoehr has done a very fine job, indeed, in translating these disparate poets, sticking with a clear, minimalist approach without sacrificing any of subtly and resonance for which early Chinese poetry is renowned. In addition, the text is accompanied by ink drawings by the multi-talented Mr. Stoehr, as well as a cover painting of his own creation. Here's a selection to tempt you to head for the library, bookstore etc. for a more comprehensive look. You want to know why I live in here on the mountain? Ha! What can I say? Is this where I am? in which green world do they bloom? Two white gulls glide to and fro. High above them a hawk hovers. they ride the wind along the river. Morning dew drenches the grass. The spider's web stretches wide. of slaughter. I wait here alone. a breeze, a moonbeam – I'm humming along. today people sing just for the squeal. go ask Yang Quong the singsong girl. talking about clothes won't keep you warm. and a thick coat is nice in a storm. and make the Buddha hard to find. fat and warm inside your mind. to those who scabble in the dirt. suddenly we find ourselves old. Is my body real or just an illusion? Who is it who asks such a question? See how one puzzle leads to another! and the red dust settles on my head. pious offerings set out for the dead. better medicine than pills or sutras. and pin it to the wall. One editorial note: for those unfamiliar with the work of Han Shan, his name literally means "cold mountain" and so the poem himself is often called "Cold Mountain" and so he is referring to himself in the above poem, "Cold Mountain's Poems." That's just a taste of this fine volume of work and belongs on the shelf of anyone interested in Chinese poetry. Mr Stoeher's are both carefully measured and natural, no mean feat. Since this Pressed Wafer is a relatively small press, I'd urge you to get a copy now if this kind of work is your cup of meat. It's liable to go out of print fast. I hope to be offering a few more poems from this collection in a future post. Finally, today is the anniversary of the birthday of B. J. Wilson, the fine, talented, underrated drummer for the band Procol Harum. In order to address this neglect and in his memory, enjoy the following. This is the game: To compete. Ads for books, ads for writing programs. to the tourist who wants to be an indian. ------------------------------I won't be lost alone..."
Well, since it's Paddy's Day and I'm working on more projects than I can count, I thought it might be time for a brief respite and some accompanying music. The first clip combines two of my favorite purveyors of urban Irish music, The Dubliners and The Pogues. To see Ronnie Drew stand side by side with Shawn McGowan is an Irish music fans idea of Fiddler's Green. If neither uttered a note, their separate unique stances sing endless refrains. The 2nd clip is of an old time favorite singer/composer, Dominic Behan, brother of Brendan, whose recordings, aside from a cut or two here and there on an anthology, are literally unattainable. He is a long-time favorite of mine and I have none of his records. How sweet the irony then that the only place they may be obtained is via You Tube, where a handful of cuts appear in a static, still photo format. If anyone knows of any recordings out there that are available, I'm loosening those eye teeth as I type. Hope you enjoy this cut, which is but a taste of what he does so well. In addition to the weekly tour through past issues of Lilliput on this blog, the Twitter poem-a-day from back issues of Lillies is progressing nicely. As with these weekly posts, each poem posted daily at Twitter is from a particular back issue, starting from the newest and heading backwards chronologically. The one caveat is the poem must be 140 characters (including spaces) or less. Today the poem is from issue #156. Check it out. Ed Baker calls our attention to the fact that last week was the 5th anniversary of the death of Cid Corman. It is hard to believe that it has been so long since this gentle soul, master poet and translator, and mentor has been gone. Cid was incredibly generous with his work, from the largest to the smallest places, the last of which I can formally attest to. He published two broadsides, "You Don't Say" and "Only," and two chapbooks, No Choice and Now/Now, here at Lilliput Review. Now/Now, I believe, was the last collection to appear while he was still alive; he proofed it in late December 2003 and it was published in January 2004, at which time he had all ready been stricken ill. 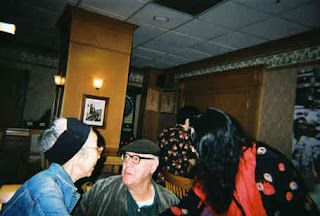 The above pictures are courtesy of Ed, who recalls Cid's straight-to-the-point way and salient advice about poems and life. He had time for all who approached him. He lived and breathed poetry and his life of near poverty attests to the low esteem in which we hold our poets, even our great ones. Ed put it succinctly when he observed that Cid's loss leaves a whole in "meaning - a silence." Sunday also marked the anniversaries of the deaths of two other literary luminaries, H. P. Lovecraft and Lady Gregory. Lovecraft is one of my many cultivated vices; when it comes to pulp fiction, he, along with Robert E. Howard, is a master par excellence. Finally, today is the anniversary of the passing of one the great blues guitar men, T. Bone Walker. If we gotta go, let's go dancing. Enjoy. Courtesy of the ineffable ed markowski, it's heading to church time. Enjoy. 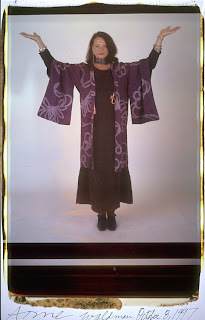 Barbara Hamby is a poet truly besotted with words, their sound, their feel, their resonance. Her poetry is never dull and she is someone whose work seems to reach out, grab you by the collar, and pull you into the page. Yesterday I ran across her new volume, All-Night Lingo Tango, and though I tried desperately not to engage (the piles calling to me from at home and at work and ...), I thought, well, I'll just open it randomly and ... whoooosh, I'm in up over my proverbials. every mudhole and mossy shelf. Forget Orlando, I'll marry myself. Of course, my predilection is for the short poem, but I was in a positively dizzy swoon as I stood reading this by my desk, attempting to put it down, put it down, put it down - now! Whew, as you like it, indeed - with a few tweeks for future archaisms, I believe ol' Will himself would have rode this one all the way down the Thames to its fertile delta and beyond. This is, of course, the preliminary of what is to come. The stage is set for the rest of the play. 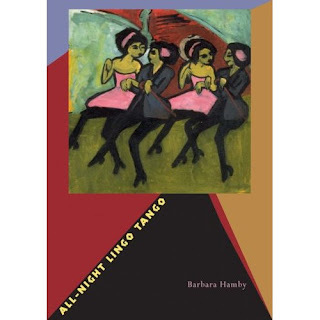 If you love words, don't miss Barbara Hamby. Her work is thrilling, a word not frequently attached poetry today. PS Check out the daily Lilliput Review Twitter poem. It's posted. 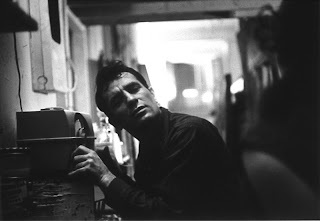 Today is the anniversary of the birth of Jack Kerouac. Whether you love 'em or hate 'em, he resonates and one has to suspect that's just the way he'd like it. Hate him, you ask? Who might do a thing like that? Well, though the evidence is purely anecdotal, there is an awful lot of backlash against Kerouac out there these days. The beauty of Jack is he put it out there, flaws and all, and even if you feel that ultimately his was a sad tragic life, he rose above it to heights others can't even dream of. Could he be a prick? Absolutely. Was he full of, among other things, an expansive, all-encompassing love for everything? Sure was. Did he die a hopeless drunk, squandering much of what might have been? What of it? If you're reaching for that first stone, know that a mirror is very fragile thing, indeed. And a few shorter pieces from Pomes All Sizes. These are not traditional haiku, simply Jack working towards something, Jack being Jack, looking for Jack, and finding something. One final note on Kerouac - my favorite novel of his is one that not too many folks talk about: Tristessa. It is slim, sad-romantic-tragic novel, with the core of some of his personal obsessions on full display. It is also deeply moving and a must read for anyone who has ever enjoyed any of his work. 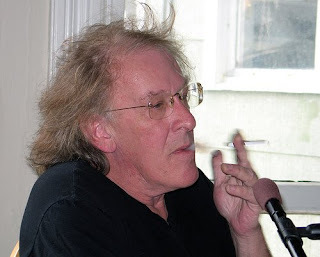 Today is also the birthday of rock pioneer, Paul Kantner, founding member and spirit of the seminal sixties band, Jefferson Airplane. My first published piece of "writing" was a review of their breakout album, Surrealistic Pillow, for my high school paper. Finally, the Twitter Lilliput Poem-of-the Day. PS Just a note to let you know that the comments section of the blog was mightily spammed over night. I'm very reluctant to disable the anonymous posting function on the blog, so what I've done is enable comment moderation on posts 14 day or older. 99% of the comments come on new or recent posts, so this shouldn't effect things much. If this doesn't work, I may have to just enable comment moderation altogether. Rather than knuckle under to spammers and disable the anonymous option, I'd rather moderate. How they get by the scripting function has got me stumped and obviously blogger/google, too. Here's Anne Waldman setting the place on fire - real nice to have the quality of the material match the poet's all out delivery. Many thanks to Christina for pointing the way. 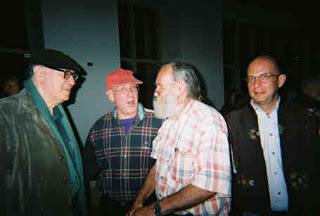 To round out a Beat kind of post, check out Gregory Corso and Allen Ginsberg "interviewing" William Burroughs in 1961. Finally, the Twitter Lilliput Poem-of-the-day - actually, 2 poems, in just 140 characters, one by W. T. Ranney and one by John Martone. Where else will you get that, folks? This is part 3 of a look at the Rubáiyát of Omar Khayyám. To see where all this started, here's part 1 and part 2. The response up to this point has been, well, nil, but sometimes you just have to do what you've have to do. Mercifully, this post will wrap up this recent fixation: some things you just have to get out of your system. Just as with Japanese and Chinese poetry, I will always have an affinity for the Rubáiyát. The lyric tone and style is antiquated, to be sure. The philosophy, though, is close to my lapsed agnostic heart. Tomorrow, when You shall be You no more? They told their comrades and to Sleep return'd. And answered "I myself are Heav'n and Hell:"
Drink for you know not why you go, nor where. That Youth's sweet-scented manuscript shall close! Ah, whence, and whither flown, who knows? This week's trip to the Back Issue Archive of Lilliput Review continues to go way down the alley: August 1993. Here are a few select nuggets from back then: enjoy.